I-GO held a press conference with Illinois Governor Pat Quinn and ComEd on April 21 at the James R. Thompson Center to announce I-GO’s new plug-in hybrid electric vehicles. ComEd funded the plug-in conversions for the two cars. Representatives of the Center for Neighborhood Technology — which launched I-GO in 2002 — were on hand as well. Gov. Quinn referred to car sharing as a significant movement in the state’s emerging green infrastructure, and said he supports the proliferation of plug-ins across Chicago and the state. 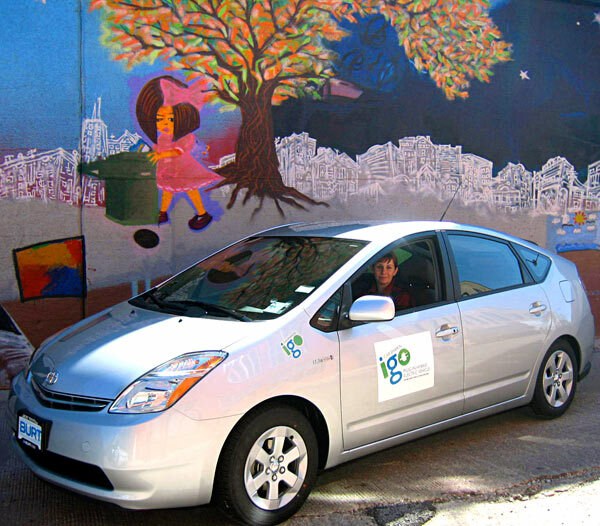 I-GO hopes to expand its plug-in program in Chicago and beyond as that green industry expands in the years to come. Check out our Flickr photo gallery of the event! I-GO now has a dedicated web page for its new Plug-In Hybrid Electric Vehicles. The page offers an overview of the converted Priuses (which were funded by ComEd), as well as tips and guidelines for I-GO members on how to reserve the cars, help maintain them in optimal condition, and operate them efficiently. I-GO has two plug-in hybrids: one at Millennium Park’s north garage, 201 E. Randolph St., and one in the South Loop at 900 S. Clark St. at the 900 AMLI residential tower’s above-ground garage. You are currently browsing the archives for the comed category.